When it comes to the color, I’m pretty sure I cracked the code on how to turn your rice into the perfect Pikachu yellow: using a homemade turmeric dye. If you don’t want to use turmeric, then you can also dye the rice yellow by mixing it with hard-boiled egg yolk (which is what I did to make Kiiroitori rice balls), or by using the ever convenient decofuri – furikake (rice seasoning) that, when mixed with warm rice, will act as a dye and change its color. Fully wrap a small amount of yellow rice in plastic wrap (it helps if it’s a long strip of rice versus a giant clump). Press the wrapped up rice into the ear portion of the mold. You’ll only want the rice to fill the mold halfway (otherwise, proportionally, it’ll be too big for the head), so make sure you fill it from the pointy part down to the middle. Press down on the rice so that it fills up all the nooks and crannies and conforms to the shape of the mold. 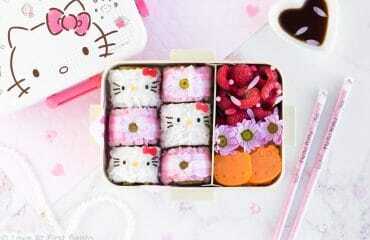 Carefully remove the wrapped up rice from the mold, and perform any “edits” to the shape with your hands. The rest of the bento box is filled with some salt & pepper shrimp, parmesan mixed vegetables, steamed broccoli, and carrot stars. The steamed broccoli is actually an essential tool for keeping Pikachu’s “hood” in place, as the egg crepe is too soft to be attached with dried spaghetti – be sure to use it to your advantage! 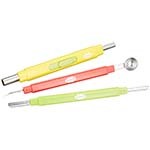 Cherry tomatoes are another “veggie tool” you could use for this purpose. 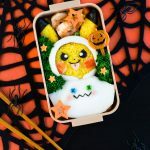 Celebrate Halloween Pokemon style with this Halloween Pikachu Bento Box! Learn step-by-step how to naturally dye rice yellow with turmeric, + easy to follow instructions that will have you shaping rice into the perfect Pikachu. Take your 2 eggs and separate the whites from the yolks. Add the whites to a small bowl and discard the egg yolks. In a separate bowl, mix together cornstarch with 1 tablespoon of water. Add the cornstarch slurry to the egg whites, and whisk together until fully mixed. Optional: Strain the egg mixture through a fine-meshed strainer – this results in a smoother egg crepe. Heat a small non-stick pan over medium-low heat. Add the egg white mixture, and swirl to coat the bottom of the pan. Cover pan with lid and allow the egg crepe to fully cook. Remove carefully with a spatula and allow to cool. Cut the slice of chicken ham in half. Place one half of chicken ham in a glass bowl (reserve other half), and pour enough warm water over top to cover it fully. Add the Blue Matcha powder and mix. Allow the ham to sit in the blue dye for a minimum of 15 minutes – the longer it sits in the dye, the darker blue it will become. 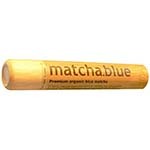 Feel free to add more Blue Matcha powder if the color doesn’t seem dark enough. Once finished, reserve the blue dye. Using the reserved blue dye from Step 1, mix in 1/4 teaspoon turmeric to turn the dye green (feel free to add more turmeric until desired color is achieved). Add the reserved chicken ham half into the green dye and allow to sit for a minimum of 15 minutes, or until desired green color is achieved. 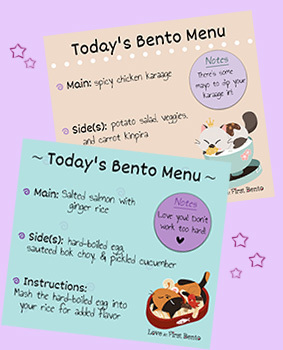 Using the panda face nori punch, punch out the full design from the nori. 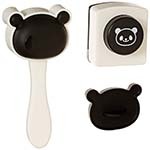 Reserve the 2 panda ears (these will become Pikachu’s eyes) and the nose/mouth piece, and discard the rest. Take the nori nose-mouth and, with a pair of scissors, cut off the curved mouth (this will become Pikachu’s mouth). Optional: Take the remaining nose piece and cut off the nose, so that you are left with the small line that connected the nose to the mouth (this will be added to Pikachu’s tongue). 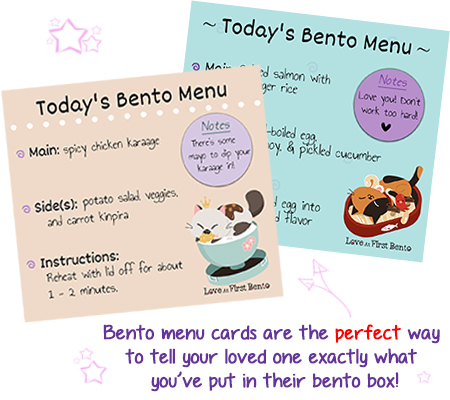 Using the multi-purpose nori punch, punch out the full design twice from nori. Reserve the two straight lines (these will become Pikachu’s eyebrows) and one caret (^), and discard the rest. Take the nori caret and, with a small pair of scissors, cut off the pointy tip (this will become Pikachu’s nose). 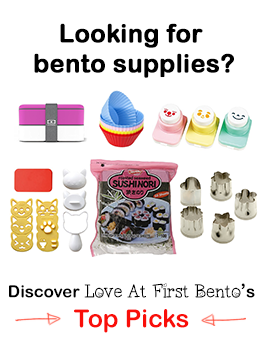 Using a piece of nori that has a straight edge (can be a new piece or scrap), use scissors to cut off a thin, straight line. Cut the nori line into 6 pieces that are each about 1/2 cm long – these will form the Mimikyu poncho’s mouth. Using scissors, cut out two small rectangles from nori (approximately 1.5 cm x 4 cm each) – these will become the black portion of Pikachu’s ears. Using the circle cutter pen tool (smaller side), cut out 2 circles from the white cheese – these will become the white parts of Pikachu’s eyes. 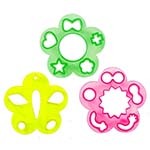 Using the circle cutter located on the pink food cutter wheel, cut out 2 circles from the red part of the imitation crab stick – these will become Pikachu’s cheeks. Using the teardrop cutter located on the yellow food cutter wheel, cut the ham using only the round portion of the teardrop cutter – this will become Pikachu’s tongue. Using the circle cutter pen tool (larger side), cut out 1 circle from the blue dyed chicken ham. 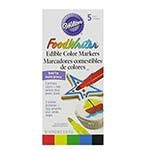 Draw an X on it using the blue food marker. Repeat with the green dyed chicken ham and green food marker. These will become the Mimikyu poncho’s eyes. Using the circle cutter pen tool (larger side), cut out 2 circles from the leftover ham – these will become the Mimikyu poncho’s cheeks. Take the cooked white egg crepe and cut it in half. Take one half and, using a knife, cut it into a trapezoid shape with a rounded bottom – this will become the main part of the Mimikyu poncho. Reserve the other egg crepe half for later (it will become the hood). In a small bowl, combine 1 – 2 tablespoons of warm water with remaining 2 teaspoons of turmeric and mix. Add your homemade yellow dye to warm rice, and mix until rice is evenly colored. To make the head: Add two scoops of yellow rice atop a clean sheet of plastic wrap, and wrap completely. Roll the rice around in your hands until a sphere is formed. Place the rice sphere on a flat surface and gently flatten it with the palm of your hand. Smooth out the sides and edges with your fingers. To make the body: Add two scoops of yellow rice atop a clean sheet of plastic wrap, and wrap completely. Using your hands, shape rice into a rounded trapezoid shape by flattening it, then rubbing the sides against a flat palm until they become smooth and have rounded corners. Don’t worry too much about getting the shape perfect, since it will ultimately be covered by the poncho. To make the ears: Add a small amount of yellow rice atop a clean sheet of plastic wrap, and wrap completely. Use your fingers to spread it into a cylinder-like shape, then ensure the rice is compact by gently pressing all sides into a flat surface, then pushing both ends in towards each other with your hands. To form the base of the ear, flatten one end by pressing into it with the palm of your hand. To form the pointy end of the ear, take your thumb and index finger and “pinch & pull” at the rice until a point is formed. Finally, take your index finger and press down on the middle of the ear, so that it bulges out in the middle slightly. Smooth out the shape with your fingers, doing your best to accentuate the curved middle portion, pointy top portion, and flattened bottom portion. Wrap the ear in plastic wrap and repeat this step to make the second ear. 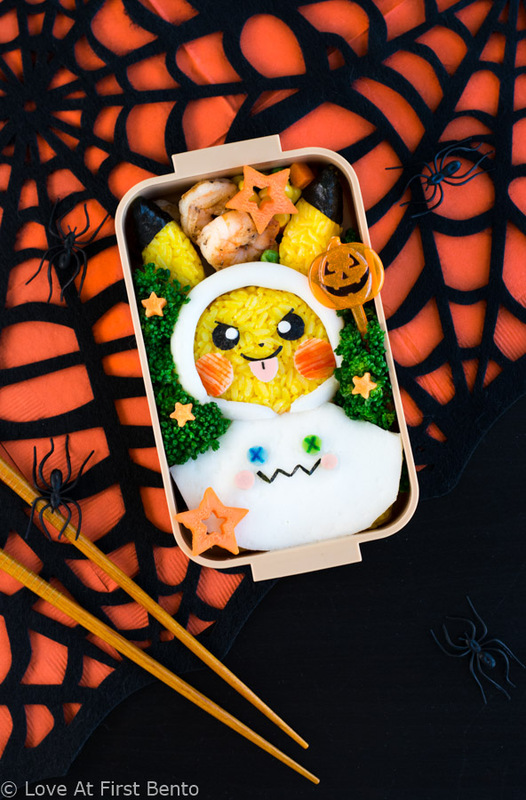 Take the rectangular pieces of nori that were to become the black portion of Pikachu’s ears and wrap them around the pointy end of each rice ear. Wrap each rice ear fully in plastic wrap and allow to rest. 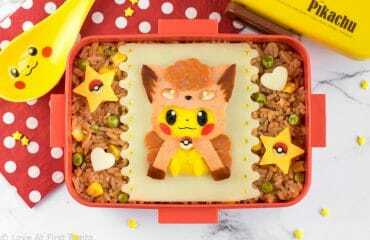 Place Pikachu’s body into the bento box you will be using. Place the trapezoid-shaped piece of egg crepe on top of the body, using some mayo or honey to help it stick better if desired. 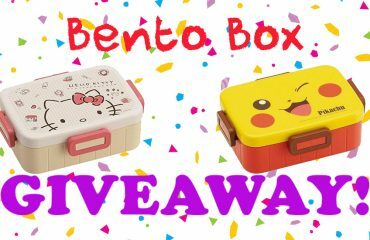 Place Pikachu’s head into the bento box above the body. Take the reserved egg crepe half and fold it in half. With the folded side facing up, carefully wrap the egg crepe around Pikachu’s head so that it forms a hood, tucking the excess underneath the head as best you can. If there’s too much egg crepe, feel free to trim it down a bit. Don’t be alarmed if the hood doesn’t stay in place – use your steamed broccoli florets to hold the hood in place by placing them strategically around the head. Make sure Pikachu’s head is resting atop the body once the hood is secured. Break the uncooked spaghetti into two pieces (~3 cm each), and stick them into the base of each Pikachu ear. Carefully insert the ears into the rice head, as if you’re pushing in a pushpin. Using tweezers, apply the imitation crab cheeks to the Pikachu face. Use honey or mayo to help them stick better. Using tweezers, apply the nori eyes to Pikachu’s face with the flat sides facing in towards each other. Place the mini white cheese circles onto the innermost tip of each eye. Use tweezers to add the “scary” nori eyebrows, which should be placed right along the flat edge of each eye. 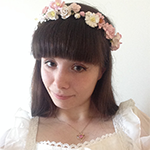 You’ll want a little bit of eyebrow to extend past the top part of each eye as well, to complete the “scary” look. Using tweezers, add the nori nose and mouth to Pikachu’s face. Add the ham tongue underneath the mouth, right in the middle. 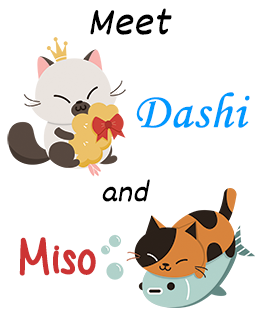 Optional: Add the small nori line cut from between the nose & mouth to the top part of the tongue, right in the middle. Take the blue & green chicken ham Mimikyu eyes and add them to the egg crepe poncho. Use some mayo or honey to help them stick better, if desired. Using tweezers, form Mimikyu’s mouth with the 6 small nori lines; they will form a zigzag W-like pattern. Using tweezers, add Mimikyu’s ham cheeks to both sids of it’s mouth (the ham should be touching the nori). 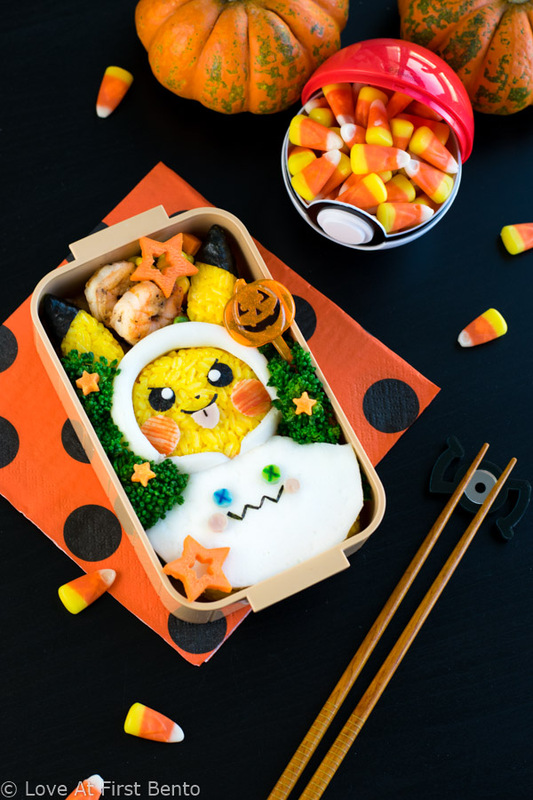 Please refer to the Halloween Pikachu video tutorial for a visual demonstration of how to shape the rice components. To aid with accuracy when decorating Pikachu’s face and the Mimikyu poncho, I highly recommend having a picture on hand that you can look at for reference. I never decorate characters without a reference image right in front of me! You have done it again!! 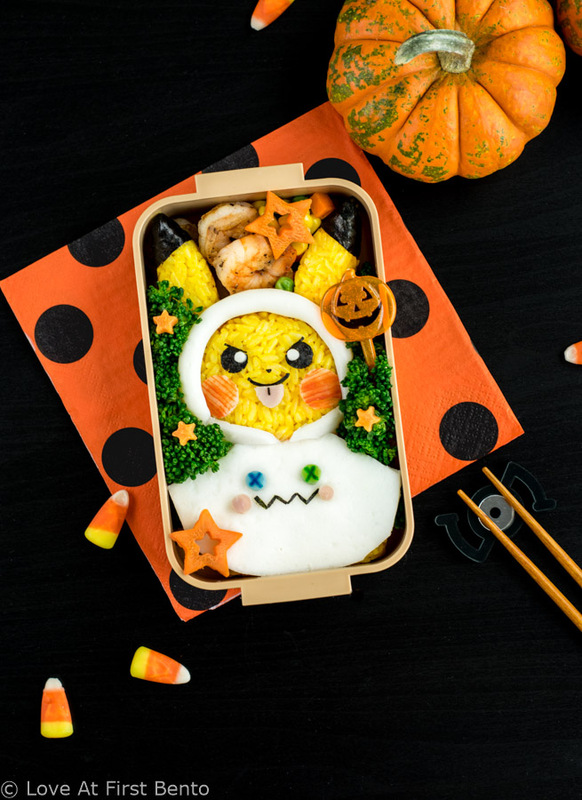 This Pikachu bento is sooo cute!! Love the costume Pikachu has… I also enjoy your stories Shannon, keep up the great work! !